I always love to share back when I first stepped into co-owning a local fashion magazine, one of the first fashion shows I attended was the Vancouver Community College (VCC) grad show in September 2017. And my first student designer interview was with one of their students. I don't think I've missed one of their grad shows since - so 12 years and counting. I was in full support when several years ago VCC chose to move their annual fashion grad exhibit onto the runway at Vancouver Fashion Week. This gives the students REAL fashion show experience. What is it like to deal with the hair team, the make-up team, choose models from the pool and showcase your work in front of a crowd that isn't filled with just teachers, parents and friends? There are many in the audience that do not know the students and will judge them based solely on their work. What an amazing learning opportunity. Student grad collections are exciting. They give us a glimpse into the future of what fashion might be through the eyes of new artists just entering the field. And VCC allows their grads creative freedom in terms what they want to explore in their grad collections. In fact their show promotion stated, "The 2019 Grad Collections celebrate and promote our graduates' unbridled fashion creativity." This means there will always be a wide range of aesthetics included, which keeps things interesting on the runway. This season we saw the work of 8 students with a varying number of looks showcased. I personally prefer to watch those with more looks as it's easier to get a feel for who they are as designers, but every collection was interesting. And one designer - Astrid Shapiro - even chose to showcase her work in a unique way, with a rack of patterns, muslins and final pieces that were dressed onto the model as we watched. Well done to all involved and I look forward to following your journey as designers. Brigita Anrevi’s style is dominantly whimsical: a playful combination of colours and patterns in a simple, clean and traditional style. Her first collection from the full-time Fashion Design &amp; Production program at Vancouver Community College was inspired by the recent trip to her hometown, Indonesia. 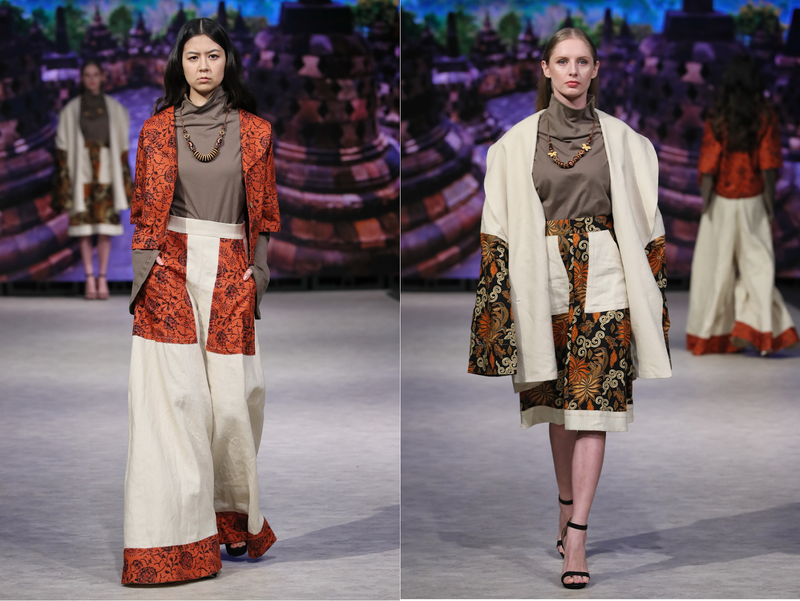 She observed the rising trend of garments made of Batik fabric produced by local artisans and chose to explore; making them wearable and approachable apart from the main function of Batik as one of national costume of Indonesia. Additionally, she used her personal style through a combination of earthy tones and the traditional Batik patterns from Indonesia in an unstructured and exaggerated silhouette. This is templated in her first collection of women’s wear separates made with only natural plant-based fabrics, including 100% Cotton and Linen; for those who choose comfort and freedom of movement over defining one’s body shape. THE CROWN designer Mahnaz Gooya’s childhood was filled with a lifetime of positive, dreamy memories about legendary royals and old Hollywood movies. Their ornate gowns with crowns, tiaras, robes and capes always fascinated her. These days these outfits have become just party costumes when, in fact, the royals' style has played a critical role in fashion progress and acted as a treasure chest for fashion's future. The goal of THE CROWN is to bring back the intricate styles and forgotten beauty of the past and absorb them with modernity. THE CROWN is a luxury brand founded in 2018 which believes every female deserves to look gorgeous. Like a queen or princess. The designer's motto is: "TRY OUR BRAND, FEEL ROYAL". THE CROWN is a multicultural brand, a bridge, between Western fashion art and Eastern handcraft art. It is the symbol of union that pushes away the boundaries and borders and gathers, worldwide, arts and beauty onto luxury garments. Evening gown styles reflect this design aesthetic through elements from the Victorian era such as layers, scalloped edges, bishop sleeves, bell sleeves and voluminous A-line and ball gown skirt. Through unique fabrication, the vintage designs morph to feel more comfortable, stylish and elegant. Monica Hoyos is a Colombian Fashion Designer based in Vancouver. She strives to create contemporary womenswear clothing with a focus on natural textiles and artisanal craftsmanship. Her designs are delicate and thoughtful; a constant balance between tradition and innovation, her clothes are ethically produced in Canada. For this collection, she is inspired by the organic patterns found in nature, such as beehives, corals and sea waves. She explores surface design methods such as embroidery and stencil to create movement and rhythm throughout the garments. Modular and repetitive shapes add density and fluidity, while the neutral color palette emphasizes construction and textures, creating an overall minimalistic and modern collection. To imagine an object that could be made real and that can also be worn. Metaphorically, it is giving a part of ourselves. To chose natural fibers, will let us stay connected with nature when wearing a garment. Every piece is created with elegance and simplicity in mind. A ready-to-wear timeless collection, inspired in the process of the “Life cycle” in an optimistic and spiritual way. That want to communicate how life could be if “ The mystery of death” was not something that worries most human beings. “Age” is not a “Decay” due to “Death”. that tends to be storytelling. With a focus on style and craftsmanship, she makes the best effort to give women the opportunity to stand out by expressing their true personality via their look. Sanaz enjoys experimenting different methods of construction, and the use of various elements of design and materials in her work. international acclaim as a fashion designer. Emmalyn Mckenna is a costume and fashion designer working in Vancouver, BC. The collection she has created consists of modern silhouettes embellished with hand painted designs inspired by 17-18th century Baroque. The contrast of a monotone, grey scale palette is balanced by delicate filigree and aviary surface design. Blending her love of illustration, history, and street wear, her garments are current and wearable. Emmalyn always designs with the belief that feeling comfortable is just as important as feeling good in the clothes that we wear. The Male Peacock - Never before in modern history, since the stiffening of the Victorian upper lip, had the British man strayed from his sombre masculinity; London Town in smoke and slate. But that was then, and this was now. 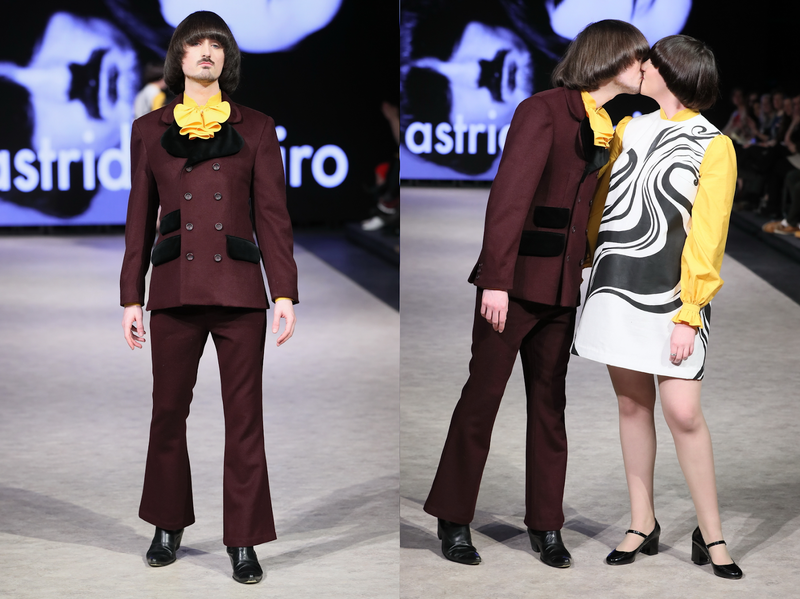 Astrid Shapiro has crafted bespoke tailored menswear for her muse, walking the path of 1960s fashion revolutionaries: Michael Fish, Granny Takes a Trip, John Stephen, and many more. Founded by Esalbel, created in Vancouver, BC; ISOTOPES is a creative outlet. The brand wants to use multiple forms of art and techniques to manipulate and create different and eccentric garments and works of art.